We would like to apologize for our sudden departure from Eagan Pointe. Circumstances did not permit us to say farewell the way we would have liked to. 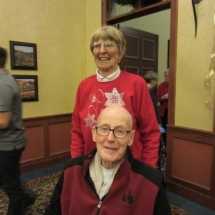 We enjoyed our stay at Eagan Pointe and appreciate the many services availed us, along with the friends we made among the residents and staff. We have moved to a residence to be nearer to our daughters. Eagan Pointe is an outstanding organization where, because of you, we built many fond memories. Best wishes to each of you in the future. We will miss you both around here, but we will cherish the fond memories that were created!